Are you enjoying my new podcast series, Money Memoirs? The truth? We all have money stories, money shame, money triumphs, money wisdom, and money gifts to share. And when we open up and actually speak the truth about money? We all reap the rewards. But most of us don’t talk about money … except with our closest friends. (Maybe.) So we stay hidden and small. We convince ourselves we’re alone. That we’re the only one who hasn’t figure this “money thing” out, yet. We suffer, in silence. But there’s a better way. 5 of my dear friends + colleagues got gracious + brave … and will show you the power of speaking the truth about money. The conversations range from business models to lineage and ethnicity; from personal stories to gender differences to universal money truths. I know you’ll love them. If you are loving the interviews, please share them with your community. As a Financial Behaviorist, Jacquette helps people go beneath the dollars and cents — straight to the underlying behaviors and beliefs creating their financial success (or keeping them from it). We cover some delicate territory, including race/ethnicity, lineage, debt, and judgments — but we also laugh. A lot. In this raw and uplifting Money Memoir, Nancy opens up about her personal journey. We cover money, divorce, her Jewish heritage, and most importantly: how she claimed her sense of value. Plus, why Suze Orman coached Nancy to “F*&% her credit score” and prioritize standing in her own truth. Sometimes, our biggest “failures” … open the most joyful doors. Learn how Maketa and his wife harnessed a big hardship — and went way deeper than the numbers. We talk honestly about race, privilege, wake-up moments, and what Maketa’s teaching his 12-year-old daughter about money that his father couldn’t have taught him. Our money stories aren’t just ours. We carry a whole lineage of financial beliefs, attitudes, and habits. But WE decide what to do with them. This intimate Money Memoir with Jennifer Lee touches on these themes of lineage — and shows how themes from our past can affect our money life, today. 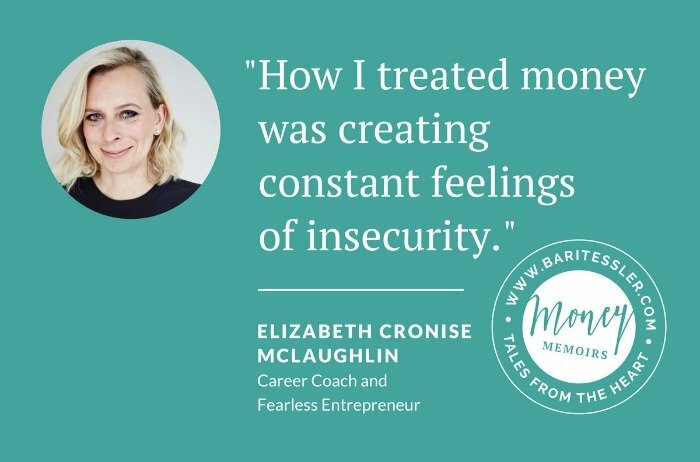 In this incredibly candid interview, “fearless entrepreneur” Elizabeth Cronise McLaughlin opens up about why she had a “scarcity mentality” and felt insecure, even earning oodles of money on Wall Street. And, most importantly: what she did to feel more safe. Inside, and out. That’s a wrap on this year’s Money Memoir Series! I hope that one of all of these conversations helps you in the coming days to find more peace within yourself. The Money Memoirs Series is my gift to you, dear community … and it’s also a great way to get a taste of the deeper work we do in my year-long money school, The Art of Money 2017. The Art of Money 2017 starts in less than a week. The Art of Money is my beloved, flagship program. It only starts once a year. And that time is now. I hate high-pressure sales tactics and rushing people to make financial decisions. I want to support you in making the most self-loving money decisions you can. That’s just one of the reasons I’ve poured so much love and energy into this beautiful Money Memoir Series — so you can get a taste of what it’s like when we go beyond the numbers and bring our full selves into our money relationships. … And that’s why I leave our doors open a luxuriously long time, too. But The Art of Money 2017 is starting in the next few days … so if you’re feeling called to make big changes in your relationship with money in 2017, I hope you’ll join us. Head over here to find out how me and my team of Transformation Assistants in the Art of Money program can support you this year. We’d love to welcome you into the growing, global community of money adventurers (from all backgrounds and income brackets) who have already said YES, PLEASE to bringing more love and awareness to their money this year … and beyond. The Art of Money starts in just a few days … will you join us? The Art of Money 2017 starts in 3 days! Are you in?